Road Trip around Japan, from Top to Bottom. Hitch hiking with a friend around Europe and sleeping at trains stations, and on park benchs only took the edge off my lust for adventure. After reading ” The Third Eye ” by Lobsang Rampa. I wanted to see Tibet and the capital Lhasa, but chasing Yeti by myself was not an option. Travel on The Trans-Siberian Railway through Russia on the other hand, was a good alternative. Fake Policeman to stop speeding drivers. Read more here. Plus, it was about time I went home to visit my family in Australia, and train travel to Vladivostok on the east coast of Russia would get me closer in the general direction. From there I could catch a freighter to Australia. Having sailed from Perth to India on a container ship a few years prior, this seemed like a good idea. After a couple of weeks I had gathered heaps of info about Russia and travel plans for train ride from Moscow and flights to Melbourne from Vladivostok. This was going to be exciting, until I received a letter from Japan. A Japanese company offered me a job as a fitter & turner and wanted me to start ASAP. This was good and bad news. Train travel would take 2 weeks, not including getting to Moscow. Not fast enough for my new Japanese boss. So it was Tokyo by plane. A Boeing 707. I packed my bags and got the cheapest airfare I could find. Sabena airlines, very bad choice but it was cheap. People would say that SABENA stood for “Such A Bad Experience Never Again” First thing I did when I arrived. I went to the Japanese copy of the Eiffel Tower. Back then, it was 2nd tallest in the world. After having my photo taken with the rest of the tourists, I went to train station and caught the famous bullet train to Nagoya, where I was going to work and earn some money to get to Australia. And do an adventure tour of Japan. At this point I would like to mention that most of my photo’s I made in Japan are Black & White, so I hope you don’t mind if I use some of them in these pages. Some color images are from post cards I collected, and will I credit them accordingly. We had no need to buy a vehicle because we used the company car. Although it would have been great to have our old 4×4 for this trip. The owner of the company had no problem with that, after we told how much free advertizing he was getting with the car full of company details. We added some extra signage as well. The roof rack was boxed in, and then we wrote, ” Traveling around Japan ” on all four sides. Together with a Japanese and German flag. On the bonnet we put the word PEACE and a big Peace Sign. dashboard, making it easier to see if we were heading in the right direction. We needed it because we could not find any English maps of Japan that showed the roads we wanted to take. Besides, road signs are only in English in the LARGE city’s like Tokyo and Osaka etc. 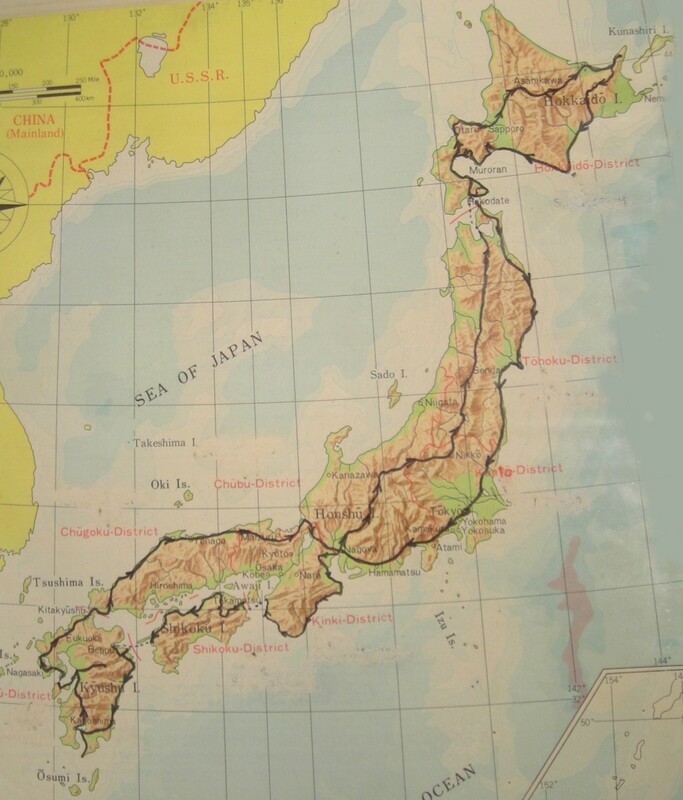 But the Japaneses maps were very good, and we soon learned how to read the sign and telly them up to our map. We just made up names for the funny little symbols like, house with 5 chimneys, man with one leg holding pizza and so on. That’s all as far as preparation was concerned. We filled the wagon with Mosquito netting, sleeping bags, cooking gear, including a Jaffle iron and clothes. And we were ready to rock and roll. Because these pages are about my Adventure, I have not included photo’s of Fantastic Castle’s which are all over Japan. Including the one in Nagoya where I lived, or any other so called Tourist attractions. These you can find on the web, so I hope you don’t mind my private collection of images. Map of our route through Japan. Nagoya is sort of in the middle of Japan, and we traveled West along the coast as the first half of our journey. The main roads are very good in Japan but we had no intention of driving freeways / highways all the time. The best sites are of the beaten track where you don’t see tourists. However, Japan is very heavily industrialized and populated along the coasts. The inner parts of Japan have rugged and large mountain-es area’s with dirt roads connecting some villages. So the first few days would be sightseeing along the coast with other tourists. Our first stop was Mikimoto Pearl Island. Approximately 220 Km’s away. This was fascinating to see how cultured pearls were harvested by divers ( Ama ) who are traditionally all women. They all dive without scuba gear but with fins and masks, and totally free dive to gather their bounty. 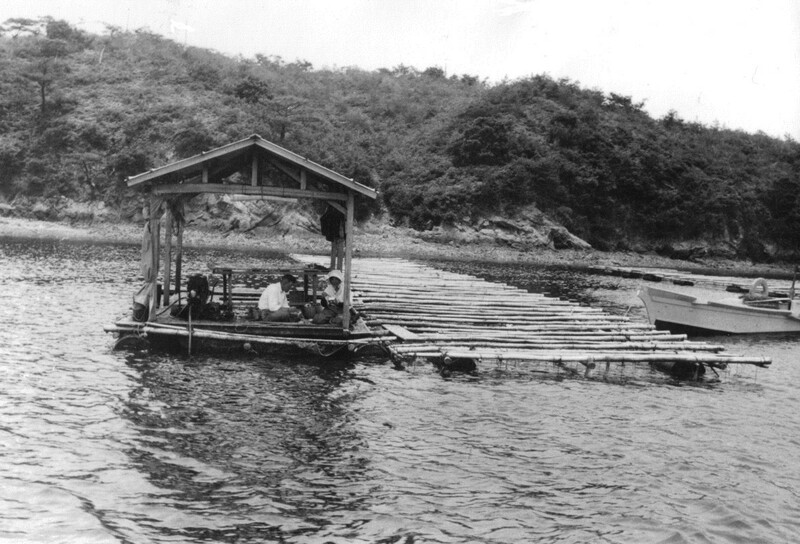 This practice dates back more than 2000 years when they collected food such as seaweed, shellfish and lobsters. Here on the island you can also watch how the nuclei are made into expensive jewelry. By the way, most people believe that the Japanese ( Mikimoto ) invented cultured pearls, but this is not so. It was a British Biologist William Saville-Kent living in Australia. Two Japanese fellows took the concept to Japan and patented his method. One of the chaps then married Mikimoto’s daughter, and that’s how it all started.